6600 Ringgold Road: A call was received regarding a shirtless man waving at traffic. Police made encountered Jacob Purdie, who advised that he was waving at his “fans.” Mr. Purdie said he was fine and did not need any assistance. Mr. Purdie moved along. 6700 Ringgold Road: Police contacted Jacob Purdie in the 6700 block of Ringgold Road. Mr. Purdie appeared to be unsteady on his feet. Mr. Purdie was intoxicated on an unknown substance. Mr. Purdie was arrested for public intoxication. 4150 Monroe Street:Police responded to Walmart Neighborhood Market after receiving a report of a hit and run. Police spoke with the victim, who gave a vehicle and driver description of the suspect. The suspect’s vehicle was later found at 4338 Ringgold Road at the Food Lion. Police encountered Joseph Freeman, who admitted to the hit and run wreck. Mr. Freeman was found to have a driver license revocation for DUI. He was charged accordingly. While transporting Mr. Freeman to the Hamilton County Jail, he continuously attempted to break the back window of the police unit. Police deployed a burst of Oleoresin Capsicum to the facial area of Mr. Freeman to gain compliance and reduce the likelihood of potential injuries caused by his actions. Mr. Freeman was transported to the Hamilton County Jail without any further incident. 406 Donaldson Road: A woman’s stolen Honda Accord was found in the parking lot behind two (2) duplex residences on Donaldson Road. One of the residents reported seeing a woman with brown hair and a medium build. She was said to have driven the vehicle to the location. The owner of the vehicle responded to the scene and recovered her vehicle. Catoosa County Sheriff’s Office removed the vehicle information from NCIC, since the car was stolen inside Catoosa County, Georgia. 1512 Prigmore Road: A caller advised that someone was pushing on her front door trying to get inside her home. She said she pushed back against the door and told them she had a gun. Upon police arrival, no suspects were located. There were no indications of forced/attempted forced entry. The reporting party did not have a description of the suspect(s). Police canvassed the surrounding area to locate a suspect. The reporting party refused having a report filed. 1417 Mack Smith Road:Police were dispatched to assist East Ridge Fire Department/EMS with an intoxicated elderly male party who had fallen and hurt himself. The male party had minor injuries and refused to go to the hospital. 421 Cedar Glen Circle:Police were dispatched to this address regarding an auto theft. The reporting party stated that her Ring® app alerted her of activity outside of her house. She stated she observed her black 2010 Subaru Legacy being taken from her driveway. The video footage shows two (2) males exit an older white truck and then take the vehicle. 3205 Old Ringgold Road: A man reported his 2018 Chevrolet Silverado as stolen. He said he left the keys in the ignition. 807 S. Seminole Drive: A woman was reportedly assaulted by her nephew, Jesse Johnson. Based on evidence of the assault and witnesses, a warrant for domestic assault has been issued for Mr. Johnson. 2006 Myrtle Avenue: A resident requested police after he observed a teenager driving at an excessive rate of speed on his street. The resident said he yelled at the driver to slow down. He said the driver stopped at the end of the block and unleashed a plethora of vulgar expletives at the homeowner. The resident requested additional speed enforcement on his street by traffic units. 6514 Ringgold Road:Mapco management called to complain about 10 homeless people seated outside the establishment. The subjects were said to be eating and annoying customers. The subjects refused to leave when asked to do so. However, the group left the location prior to police arriving on scene. 1503 McDonald Road:Erlanger Mental Health worker contacted ERPD to check on a person possibly in crisis at the Waverly Motel. Officers were unable to corroborate the information. South Terrace / OLPH:A vehicle fire that began on the terrace resulted in the driver pulling into the parking lot of OLPH. Chattanooga Fire Department responded and extinguished the fire. East Ridge Fire personnel also responded. 4127 East Ridge Drive: Police responded to this location on a report of a disorder. Upon arrival a woman was seen running from the back of the residence. She was directed to stop running and she complied. Police then encountered two additional women, Tabitha Harmon and Jada Sims, who were inside the home. Ms. Harmon said she was attacked by Ms. Sims but did not want to cooperate with police for prosecution purposes. Ms. Harmon refused EMS. 1503 McDonald Road: Police were called to the Waverly Motel after two (2) men were observed in their attempt to steal a Ford Mustang that was in the parking lot. The suspects broke the spoiler on the Mustang during their failed theft attempt. The suspects arrived on scene in a white Kia Soul vehicle. Police located pliers and a metal punch tool inside the car. The license tag on the suspect’s vehicle had been folded to obscure the registration information. 5308 Connell Street: ﻿Police responded to this location on a report of a disorder. It was determined that Jaquan Suttles had assaulted his juvenile live-in girlfriend. While the assault was taking place, the girlfriend was holding their 7-month-old child. Mr. Suttles was taken into custody. The juvenile’s mother was notified and responded to the scene. EMS was called to the scene to check on the two (2) juvenile victims. Child Protective Services was notified of the incident. 200 Hilldale Drive:Police received a call about a suspicious male subject seen walking through the area. Police arrived on scene, but the subject was gone from the area. McDonald Road / State Line Road:Police received a call about a party selling items from his car on a vacant lot. The subject was told to gather up the items and seek a permit at East Ridge City Hall. 601 Walnut Avenue:Ronald Philpott was served with an East Ridge warrant at the Hamilton County Jail for possession of methamphetamine. 3657 Ringgold Road:The manager of the Cascaded Motel requested police assistance in removing a subject from room 50 after discovering they were taking medication and drinking. The subject was driven to the east end, so they could find another hotel to stay at. 5442 Dupont Street:Pamela Ervin wanted police to remove her sister because she was drinking wine. Police advised her to speak with the court to have her sister evicted. 918-A South Crest: A white Ford van was vandalized at this location. It was reported that at some point between 7:00 pm on April 5, and 4:45 pm on April 6, someone broke the mirror and door handle off of the van. 5712 Ringgold Road:Police received a call regarding a woman that had been laying in front of Groome’s Transportation for several hours and refused to leave the property. Police encountered Norma Diaz, who was very hostile toward police and advised she was attempting to get back to Atlanta, so she could get back to work at Grady Hospital. Ms. Diaz told police she was a dentist and a doctor and made incoherent statements. Police spoke with Ms. Diaz’s friend, Robert, who said Ms. Diaz suffers from psychiatric problems that are induced from years of drug abuse. He said she stays with her two (2) sons in Chattanooga. A call was made to the phone numbers provided for her sons, but the calls were unsuccessful. East Ridge Fire Department personnel and EMS responded to the scene to check Ms. Diaz out. During their discussion, Ms. Diaz again became agitated and attempted to walk out into Ringgold Road. Due to concern for her safety, officers placed her into protective custody and transported her to Parkridge East for further evaluation. 6721 Ringgold Road:Police were dispatched to the Family Dollar store after an unknown woman attempted to use a fake ten-dollar bill to purchase several items inside the store. The woman left the store prior to police arrival. 4200 Spriggs Street:Police located a dog running loose after a concerned citizen called in about it. The dog appeared as though he had been on the run for a while. Police took custody of the dog and transported it to the East Ridge Animal Shelter. 302 Dunlap Avenue:Police received a call about an argument. The female caller said she and her boyfriend had been arguing and he would not let her leave. 4222 Ringgold Road: Police received a call from the manager of Speedway. The manager said a man, later identified as James Picklesimer, came into the store and attempted to pay for merchandise with a fake $100.00 bill. Upon being located, Mr. Picklesimer was arrested and charged with criminal simulation. The counterfeit money was collected and placed into property and evidence at the police department. 5326 Ringgold Road: Police observed an open door at the vacant building that was formerly Ryan’s. Officers checked the interior of the vehicle but did not locate anything unusual. Officers were able to speak with a contact person, who said they would respond to the scene. Officers were unable to secure the door. 6519 Ringgold Road:An anonymous caller advised they knew of an Amish woman in room 105 of the Super 8 that was being held against her will and forced to be a prostitute. Police made contact with the occupants of the room and all advised that everything was okay. 1502 McDonald Road:Police arrived on scene and contacted Sandra Lefever and Rhonda Burson. Ms. Lefever, a LifeCare nurse, advised she wanted Ms. Lefever to be removed from the facility due to causing a disturbance. Ms. Lefever said that Ms. Burson had been verbally aggressive with staff and was disrupting the normal procedures of the facility. Police spoke with Ms. Burson, who stated that she was only raising her concerns with staff. Ms. Burson agreed to leave the location and call back to set up a meeting with staff later. Ms. Burson left the area without incident. 5700 Ringgold Road: Police conducted a traffic stop on a gray Toyota 4-Runner. There were two juvenile occupants inside the vehicle. A Taurus 9mm handgun was in the driver side door panel. The driver said the firearm belonged to her mother. 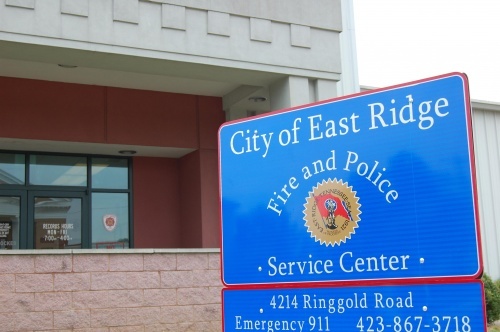 The firearm was placed into property and evidence at the East Ridge Police Department and the gun owner was advised on the procedure to retrieve her firearm. 6401 Ringgold Road:A juvenile was arrested for unlawful possession of a firearm after a vehicle search during a traffic stop at the McDonald’s restaurant. 4404 Vester Lane:Police responded with East Ridge Fire Department personnel to a fire. The people at the residence were burning unwanted clothing items. The fire was extinguished, and the people were advised of burn laws. 5326 Ringgold Road:Police observed a man attempting to make entry into a closed business. The man identified himself as John Austin. He fled on foot from officers. After a brief foot pursuit, Mr. Austin was taken into custody. 1100 Hilldale Drive:Police were dispatched to this location after a male subject, wearing dark clothing and a bandana, was seen walking around looking in driveways. Police contacted the male subject near the neighborhood pool. The male encountered was a juvenile, who stated to police that he was on his way home and had cut through the neighborhood to do so.